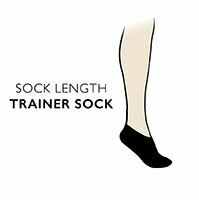 If you really hate your socks to show beyond the tops of your trainers, then these unisex Puma Footies Trainer Socks are low enough and well designed enough to do the job! These soft, cotton rich liners (available as a twin pack) are cut very low at the ankle, but further over the front of the foot than general purpose socks. This means that an elastic arch support band goes right around the foot in the ideal place for its compression benefits. The backs of the liners are themselves lined with silicone heel grips, keeping them firmly but gently in place as you move.